Smoothie bowls are popular with the high-carb eaters, but what about us low-carb dieters? 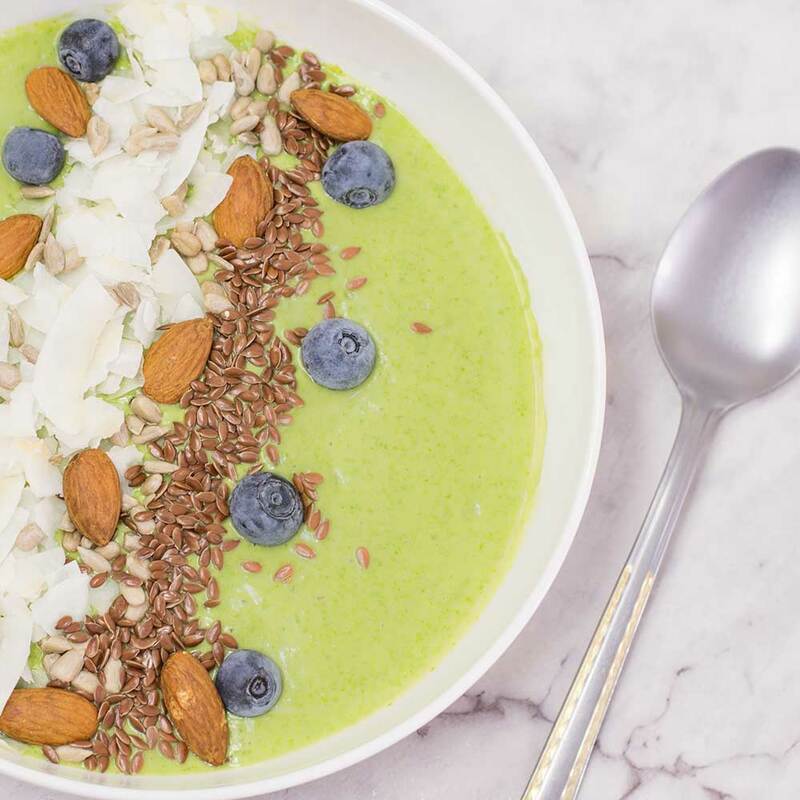 Well we don’t have to miss out with this delicious low-carb Keto Green Smoothie Bowl Recipe. I love having a smoothie bowl when the weather is warm, they are light, refreshing and just really enjoyable. I top mine with our Keto Granola. 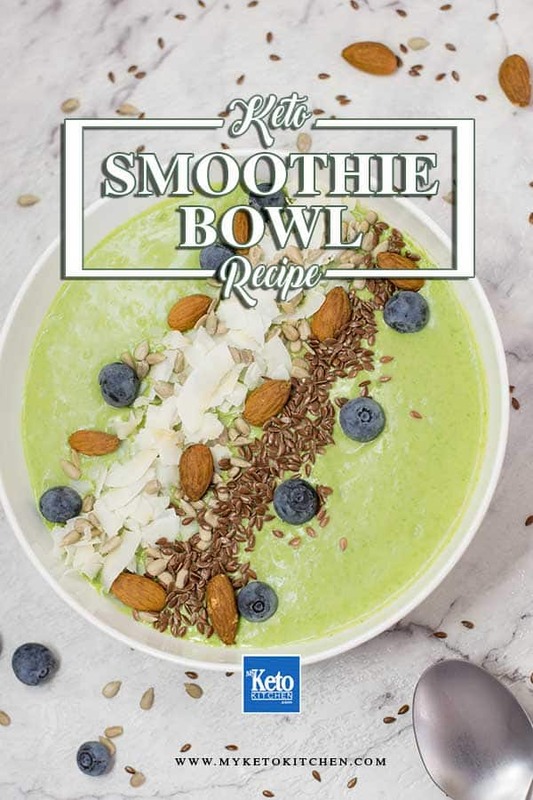 I add a good quality collagen protein to the smoothie bowl as this type of protein is great for your skin, joints and connective tissues without being over the top like a whey protein product. It also has no nasty fillers or artificial sweeteners. To give the smoothie a low-carb, high-fat boost I also add some fast acting MCT powder for its ketone enhancing benefits. This low-carb smoothie bowl recipe makes 1 huge serving and is best eaten straight after it is made. Be aware when adding your own ingredients to your keto smoothie bowl that you’ll need to recalculate the macros to ensure that it remains low carb. Place all the ingredients, except the toppings, into a high powered blender. Blend on high until all ingredients have blended well. Pour into a bowl and decorate with your favorite toppings (scroll down for our suggested toppings). The keto smoothie bowl recipe is very easy to make and full of flavor and textures. Very Low-Carb full of Healthy Fats and all the "Essential Nutrients" to get your day started. This Green Smoothie Bowl the Perfect Keto meal! But don't just wait for Breakfast you can enjoy this bowl of Superfoods anytime of the day. You can use a variety of toppings for your keto smoothie bowl here is a selection of our favorites that will keep it low-carb for you. Keto Smoothie Bowl Recipe. This super quick and easy recipe with have you enjoy a light and tasty smoothie bowl in less than 10 minutes! It contain no fruit, is sugar free and is loaded to MCTs to fuel you through the day. Want More Healthy Low Carb Smoothie Recipes? Try these other low-carb smoothies, they’re all full of nutritious keto friendly ingredients and taste fantastic. 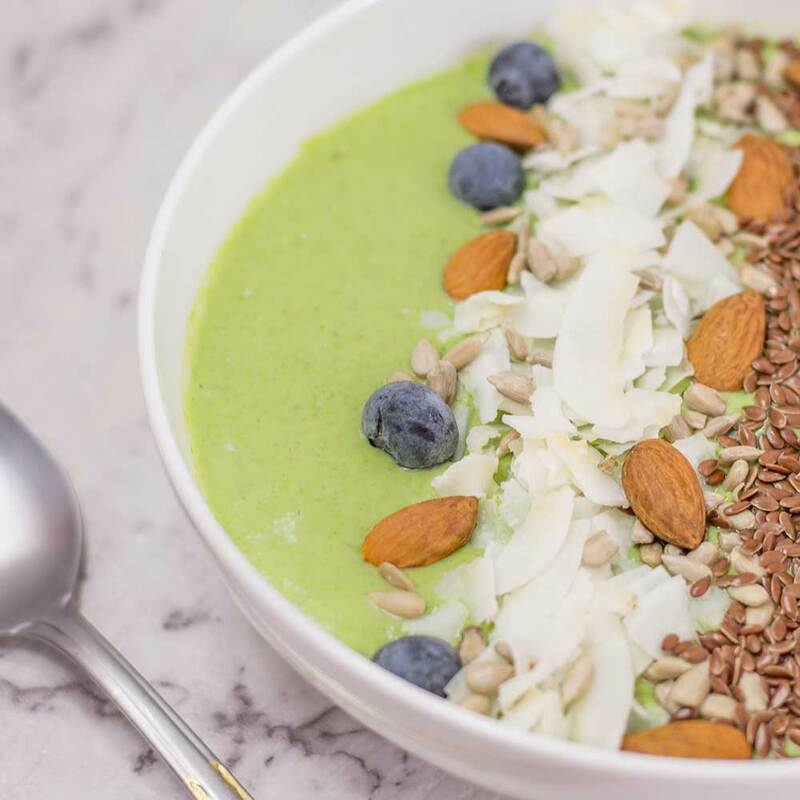 To make a larger batch of this Keto Smoothie Bowl recipe adjust the servings above.